MicroMac provide programming and technical consultancy services, specialising in web-based applications and technologies. MicroMac and its parent consultancy company, Micromac have a combined total of over 50 years' experience of computer systems design. 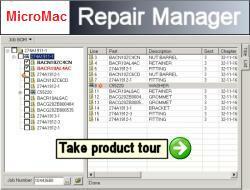 In recent years MicroMac have developed major systems to support aircraft component repair and overhaul, the collection and analysis of test results for electronic equipment, and the control of machine tools. We are developing these systems to have a wider application and to take advantage of current technology. MicroMac have substantial experience of relational databases and have written all of our major systems over the last five years using Oracle or SQL Server. We use the latest Microsoft products and web technologies, including the .NET Framework, XML and Dynamic HTML. We are presently implementing systems for BAE Systems and Alenia Marconi, and developing the MicroMac Repair Manager repair and overhaul system. Other projects include a web-based job and time booking system, and test analysis software using .NET technologies.